SUNNY BRAE – A prime suspect has been arrested in the string of burglaries that has had Sunny Brae residents on edge for weeks, but the Arcata suburb’s guard is still up. 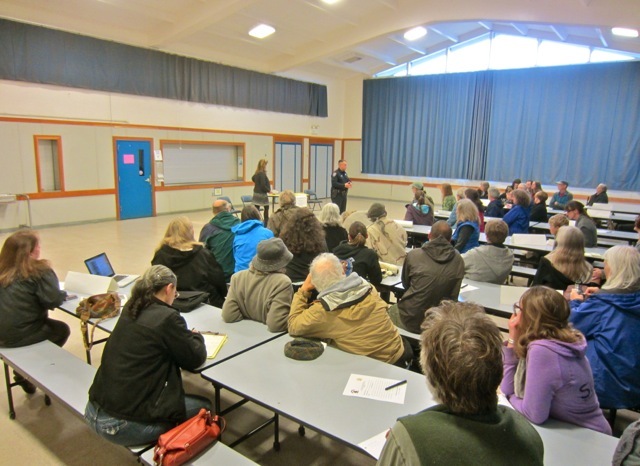 on Thursday., March 28, about 50 ’Braers turned up for a crime prevention meeting organized by City Councilmember Susan Ornelas at Sunny Brae Middle School. Ornelas prepared the school cafeteria tables with cards bearing the first names of Sunny Brae subdivision developer Chet Spiering’s family relations – which are the names he gave the neighborhood’s streets when he laid them out in the early 1950s. Officer Anthony Fox and City Councilmember Susan Ornelas. Ornelas introduced APD volunteer Ginger Campbell, a “volunteer extraordinare” who helps organize Neighborhood Watch groups. Three are operating in Sunny Brae, one in the Sunset area and another on I Street, with still more in the works. The groups help spread awareness of other chronic neighborhood issues, including speeding vehicles and loose dogs. “We’re doing really well city-wide,” Fox said. Two blocks is the optimal size for a group, as it includes “a small nucleus of people” who can be well-connected. The neighborhood watch groups are initiated by residents going door to door to solicit participation. Once five or six households are on board, that’s enough critical mass to contact Campbell or Fox at APD, (707) 822-2428, and get the ball officially rolling. An initial starting meeting will include discussion of how to select leadership and basic crime reporting. With that, the group evolves. Fox offers new groups a presentation in how to protect against property crimes, including burglaries. A huge part of neighborhood watchfulness is simply making the leap to telling police what they see. Many residents likely spotted suspected burglar Timothy Dickinson’s gold Bravada in their ’hood around the time of the burglaries, but didn’t report it. Doing so might have solved the cases much earlier, and prevented further crimes. Lately, he said, the watch groups have been communicating among themselves, further adding effectiveness. Fox affirmed that unless a criminal is violent, he or she will be released from jail in short order. “Most crimes are committed by small groups of people,” he said. A woman said she hadn’t been aware of crime problems in Sunny Brae, or how to address them. She wondered what local news resources are available to keep citizens abreast of neighborhood news and crime prevention. Resident Susan Anderson suggested the nextdoor.com online tool and the “Sunny Brae Crime Prevention Network” Facebook page. Anderson cautioned against reporting rumors and false reports. “Be responsible,” she said. Fox said burglars and vandals use a variety of methods. Some break windows, others knock down doors. Further, crooks fit no single profile. A burglar might be a traveler, a longtime resident or even a college student. 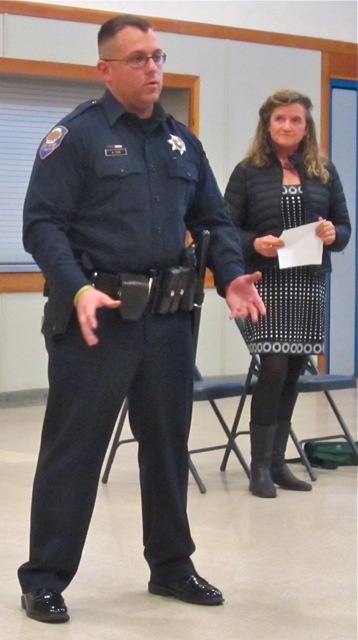 Neighborhood Watch meetings might take place at the Library, in Redwood Park or private homes. Initial gatherings tend to attract a large crowd, but participation then drops off as some residents assume others are handling the work. At that point, the committed core group emerges. “It can,” Fox affirmed. He said part of his presentation to the groups is identifying conditions that encourage breaks ins. Attendee Kim Class said she has seen bicyclists casing cars as they rode slowly past her home. “I could feel that something was way off,” she said. “That should be reported,” Fox said. Ornelas advised that neighborhood watchers be observant for details that will help police. “Watch for unique things about people,” she said. “Look at shoes. They can toss away a jacket, but probably not shoes.” Unique features also include tattoos. This entry was posted on Wednesday, April 10th, 2013 at 2:10 pm	and is filed under News, Community. You can follow any responses to this entry through the RSS 2.0 feed.